A FLAC file is a Free Lossless Audio Codec file. It is a widely used lossless musical file format, which means it will not cause any sound quality loss. Usually, flac file size is only half the original wav size. MP3 stands for Motion Picture Experts Group Layer 3, which is a digital compression algorithm for audio file. The mp3 file can be over 10 times smaller when compared to a raw source file. Today, the MP3 file format is the most popular musical file formats in the world. PowerISO can convert flac files to mp3 format, thus can significantly decrease the file size, but only bring slightly loss in sound quality. Converting flac files to mp3 format can also provide better compatibility with media player software or devices. 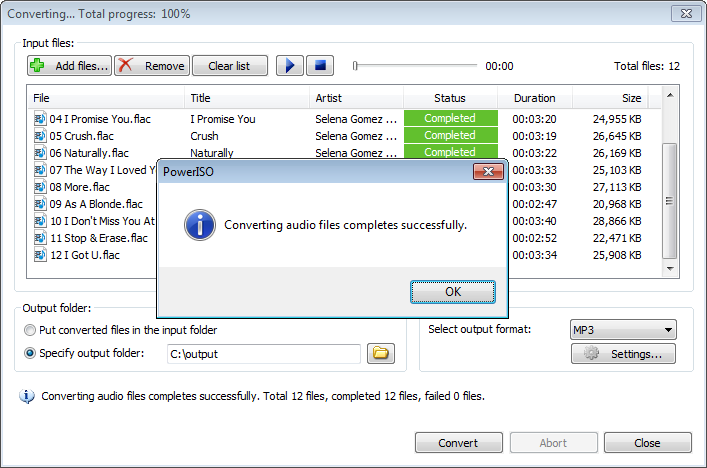 Please follow the steps to convert flac files to mp3 with PowerISO. Run PowerISO, and select "Tools > Audio converter..." Menu. PowerISO Audio converter will popup. 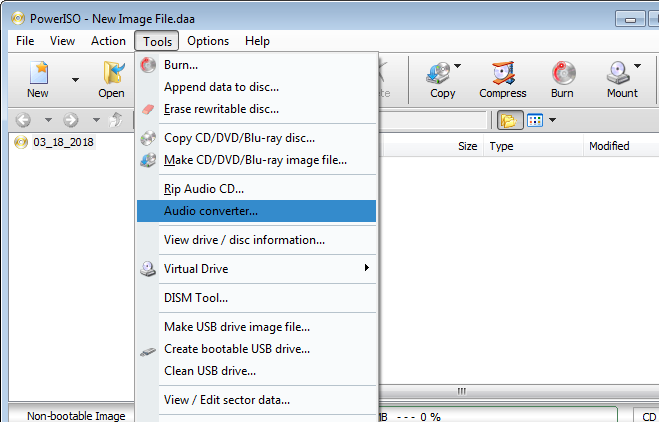 Click "Add files..." button to add the flac files to the convert list. The "Add files" dialog will popup. Navigate to the folder containing the flac files, select them, and click "Add" button to add the flac files to convert list. 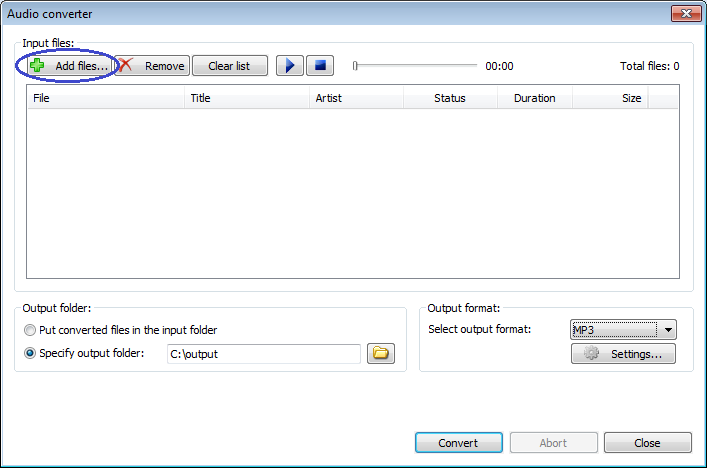 Output folder: You can put the converted mp3 files in the input folder, or put them to a separate folder. Output format: The output format can be mp3, flac, ape, ogg, wma, or wav. Please select "MP3" for output format. You can change the mp3 encoder settings by click "Settings..." button. 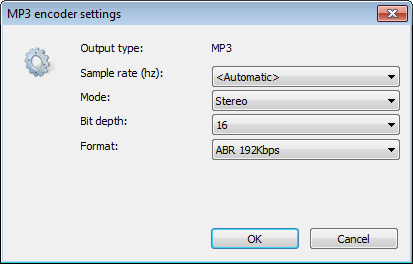 In "MP3 encoder settings" dialog, you can change sample rates, sample mode, and sample format. The bit depth is 16 for mp3 encoding. Click "OK" to close the encoder settings dialog if all settings are correct. Click "Convert" to start conversion after you have added the files and select the appropriate settings for the conversion. 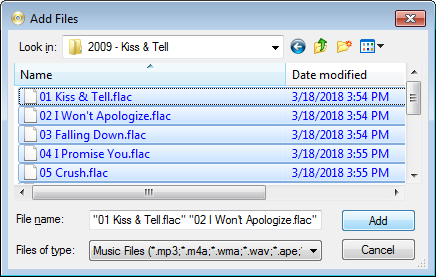 PowerISO will start converting the flac files to MP3 format. You can see the detailed progress information when converting. You can cancel the conversion by clicking "Abort" button. After all files have been converted, you can see the message, "Converting audio files completes successfully". It will also show the number of files converted successfully and the number of files failed to convert.